Absolutely Free arose from the spastic art-punk ashes of DD/MM/YYYY last September to become one of Toronto's most exciting new bands. The group's name is a nod to the Mothers of Invention's 1967 LP, and they share Frank Zappa's cynical wit. Drummer and guitarist Matt King introduced one song saying, "This one's called 'Teenage Suicide.' Don't do it," as this sense of humour also became apparent in the band's eccentric vocal lines. 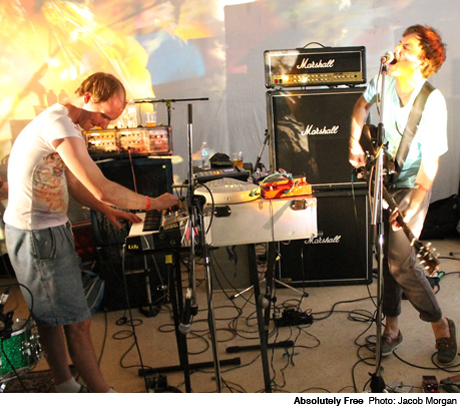 Sonically, Absolutely Free drew from the rhythmic experimentation of Krautrock. With two drum sets right at the front of the stage, the four members would alternate between bass, guitar and percussion, hunching over keys and knobs to produce satisfying electronic skronk. In this way, the band tastefully brought aspects of '60s underground culture into the 21st century without succumbing to any flower-power trappings. Absolutely Free played both "UFO" and "Clothed Woman Sitting," which have been floating around online as 30-second samples. Although their sound already feels fully realized, they don't have any recorded material available yet. But this should change soon, as Moshe Rozenberg and Jordan Holmes assured Exclaim! that a 12-inch single is currently being pressed and will be out in the fall. For now, watch out for the next time these guys play a show, because they are an absolute revelation live. To see Exclaim! 's ALL CAPS! photo gallery, head here. Absolutely Free Return with "Still Life"